SMC4 Social Media Connector for FileNet provides a seamless gateway to automatically capture and release social communications from Facebook, Twitter and other social feeds directly into FileNet. Using our content analytics for social feeds, social communications are analysed by SMC4 and can be automatically released into a central capture file or automatically sent to FileNet workflow baskets. 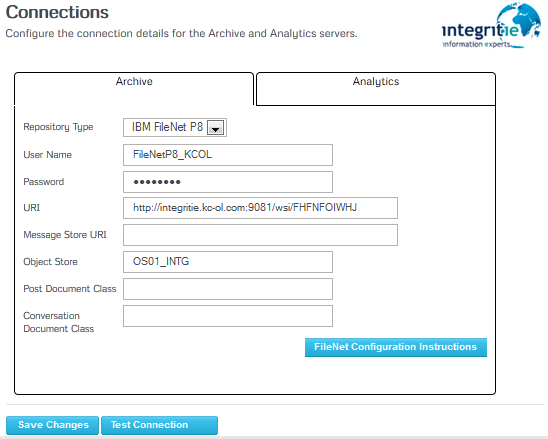 2) Go to the Administration Connections screen and add your FileNet Address. To test the Social Media to FileNet connector simply push the button and follow the self onboarding steps. Once you have signed up to SMC4 simply go to the SMC4 Adminstration, Connections page and add your FileNet connection detail. Social feeds will then automatically transfer to FileNet.